Mulch is an important part of tree care that is often overlooked. Many trees are surrounded by turf grass or other plants, which can stifle their growth. Proper mulching can be the key to trees that not just survive, but thrive. In nature, trees live in a complex organic environment. A forest can be made up of hundreds of different plant and animal species, each contributing something to its surroundings. The forest floor is composed of layers of organic material, from fallen and rotting trees to tiny plants that serve as ground cover. This complexity provides a habitat for animals, plants, and microorganisms. In this environment, a tree is able to send out its roots into rich, fertile soil and get the exact nutrients it needs to thrive. In our urban environment, trees are often in competition for resources with turf grass. or may even be surrounded by non-organic materials, such as concrete. The soil around a tree can easily become compacted due to above-ground traffic. While we cannot completely re-create the forest environment in a city, we can help reduce soil compaction and competition by correctly mulching around trees. When mulch is properly applied and maintained, trees are able to grow sturdier root structures, tree health is improved, and we benefit from hardier trees that can live for decades. Does the Type of Mulch Matter? Despite the various ways that mulch is marketed, packaged, and sold, there are only two basic types: organic and inorganic. Organic mulch is made up of plant material, and can come from a variety of sources. Wood chips, bark, nut shells, and pine needles are common components. Inorganic mulch includes anything that is not plant or animal material and does not break down naturally. Crushed stone, recycled tires, and landscape fabric are common types. While inorganic materials can be useful in certain landscaping applications, they are not beneficial to trees, and may actually be harmful if used as tree mulch. Choosing the best mulch requires understanding the needs of your tree and the underlying soil conditions. Soil density, pH, drainage, and composition all have an effect on the ability of a tree to send out roots and get the nutrients it requires. While mulch is not primarily a fertilizer, it is composed of organic matter. Insects, earthworms, and microorganisms break down the organic material become food for the tree. 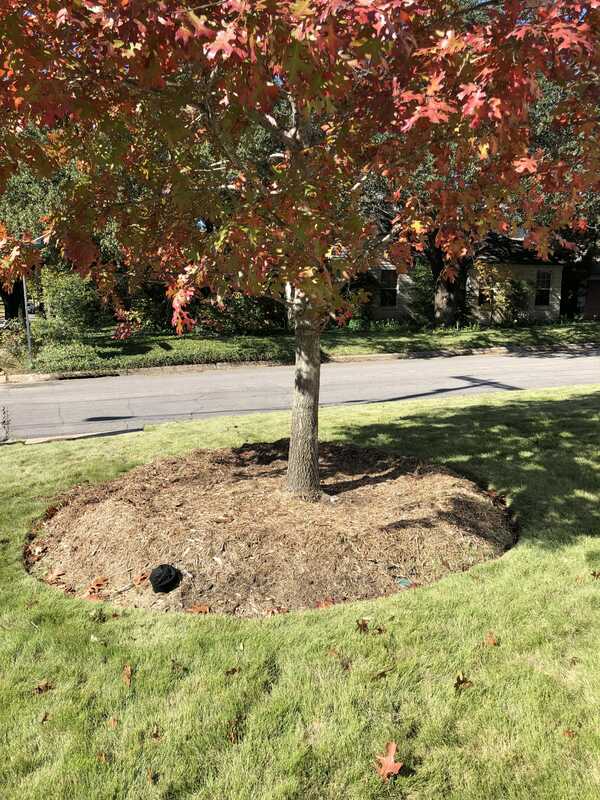 Mulch selection and maintenance can influence which types of organisms are able to survive in the mulched area and benefit (or harm) the tree. Most commercially-available mulch is made from tree material that is shredded to a consistent size, partially composted, and often dyed brown, black, or red. Commercial mulch is generally long-lasting and a good basic mulch. We recommend sourcing mulch from a reliable local producer that does not use chemical treatments or dyes, but composts mulch naturally. Can I Use Wood Chips or Grass Clippings as Mulch? Tree care businesses or municipalities may sell wood chips produced as a waste product of tree trimming or removal. If you have tree work performed, the tree trimmers may leave wood chips behind. These chips can be a cost-effective way to get organic material, but are not identical to commercially-produced mulch. Best practice is to compost any fresh wood chips before using. Grass clippings, leaves, and other landscape waste material should be thoroughly composted before use to help prevent weed growth and neutralize any chemical imbalances. Sawdust should likewise be composted first, but sawdust from treated lumber should never be used as mulch. If modifications to soil pH are recommended, certain materials can be added uncomposted to mulch to achieve the desired effect. Ask your arborist for any special needs your trees may have. How Should Mulch Be Applied? Whatever type of organic mulch is used, it must be properly applied to provide its full benefits. Mulch that is improperly applied may even do more harm to the tree than good. While the planting of a new tree is the ideal time to begin proper mulching, any tree can benefit from mulch. For some trees that are in compacted soil or with root girdling issues, it may be best to perform a root excavation (such as by airspading) before mulching. If you have any questions or concerns about your trees’ roots or wonder if they could benefit from root zone excavation, contact your arborist. Lay mulch to cover a radius of approximately three to ten feet from the trunk, depending on the tree size. The dripline, or outer edge of the canopy, can be used as an estimate for the circumference of the critical root zone of the tree. For smaller trees, measure the diameter of the trunk (in inches) and multiply by 1.5. This is the radius (in feet) of the critical area. For greatest effectiveness, it is recommended to remove turf grass in the mulched area. A tree that is newly planted or that has had root excavation performed will likely already have a good buffer between it and the turf. Established trees may have turf grass covering all or part of the natural root flare, which should be carefully removed. Any brick, stone, or metal tree rings should be outside the critical root zone. Install mulch to a depth of two to four inches within the dripline circle. Too thin a layer will be less effective at retaining moisture and regulating soil temperature. A layer that is too thick may keep the soil too moist and harbor harmful bacteria or fungi.. The mulch should not touch the trunk of the tree. Leave a margin of about four inches. Organic matter piled up against the trunk (a “mulch volcano”) can cause the bark to retain too much moisture, leading to trunk and root rot. If a tree needs more water, you can form an additional ring of mulch about halfway between the trunk and the edge of the mulch zone. This “donut” will help to funnel water to the central roots of the tree. Make sure that water does not pool against the trunk. Refresh the mulch in late spring and in fall, or as needed. Inspect regularly, especially after heavy rain or storms, and even out thin/thick patches. When the whole area is reduced through decomposition, re-apply to original depth. Expand the mulched area as the tree grows. Keep covering all the way out to the dripline, if possible. Mulch should be expanded as the tree grows, and refreshed regularly. Mulch that is piled too thick can lead to excess soil moisture. Mulch should not touch the trunk of tree, as this can lead to rot. In North Texas, it is common to have fairly dense, clay-like soil that tends to be more alkaline than acidic. Ensuring good drainage during wet weather can be difficult. In dryer periods, the soil can harden and crack. Mulch can help create a stable, permeable layer that can regulate moisture better than the underlying soil. Mulch also insulates the shallow roots from swings in temperature that we can have during the spring and fall. Most native trees and shrubs are adapted to the natural soil pH and composition, and only need basic mulching. Other species, however, may benefit from slightly acidic mulch.